This quilt, Summer Wedding, is my entry for the Bloggers' Quilt Festival. It's not the first time I've blogged about it, but I have a couple of new photos of the recipients to show which make it really very special. 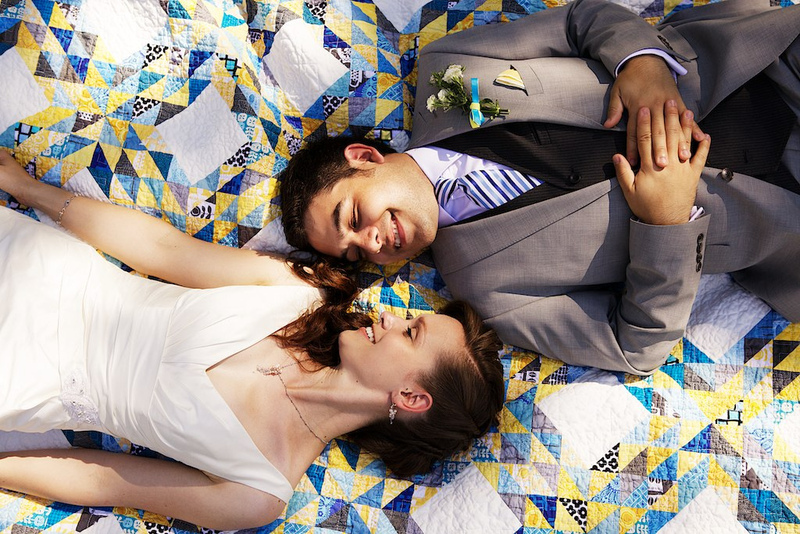 I made this quilt for the wedding of a young couple who met when they were my students at Queen's. They worked in my lab on my research project six years ago and I supervised their Honours theses. I had to keep this project under wraps while I was making it since the bride reads my blog, so there are no progress photos to speak of. 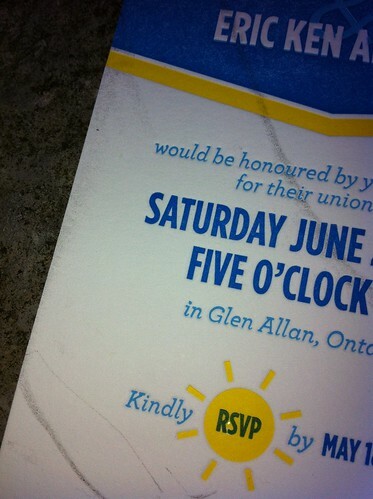 I knew the wedding colours were blue and yellow, and I used the invitation as a benchmark, throwing in some black and grey for a bit of gravitas (married life isn't all sunshine and daisies, you know!). It was a real endurance test! 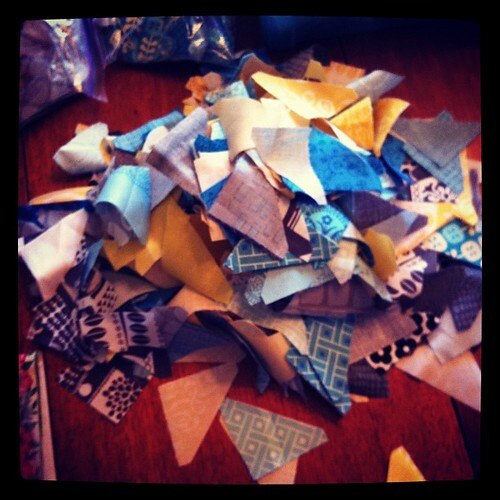 There nearly 1000 HST units in this quilt, and I cut more than half of them by hand using the Marti Michell templates. It took ages! 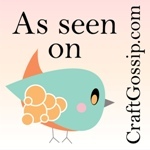 Finally, I succumbed and bought a Sizzix BigShot Pro and cut the rest of them in 20 minutes. 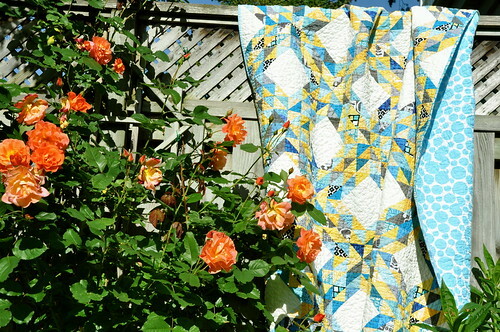 The quilt pattern is based on the traditional block Ocean Waves, machine quilted by me on my home machine. The background is an ivory Essex linen/cotton blend. It finishes 64" x 70". In her speech at dinner, the mother of the bride, a midwife, thanked me for giving the newlyweds the "babymaker". 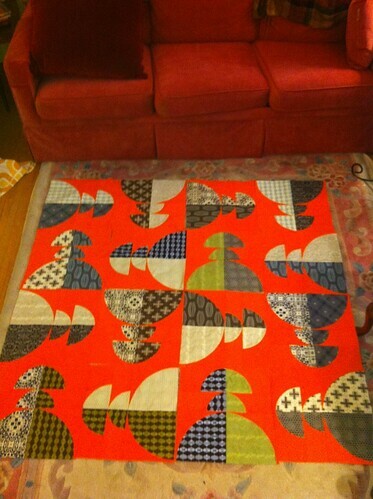 I hope I'll be making a baby quilt before too long! 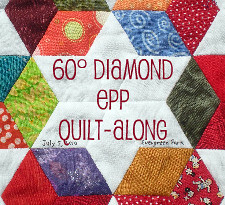 Thanks for dropping by - enjoy the rest of the entries in the Bloggers' Quilt Festival! I've been working like a demon on a research grant which was submitted on the 15th. And of course all the things I was pushing off until after my deadline caught up with me this past week. But this weekend I devoted myself to pure enjoyment. I stayed in my pajamas all day today and sewed. I worked on a WIP that I had to put aside when I ran out of background fabric. Once the replacement fabric came in, I was too snowed under to do any work on it. 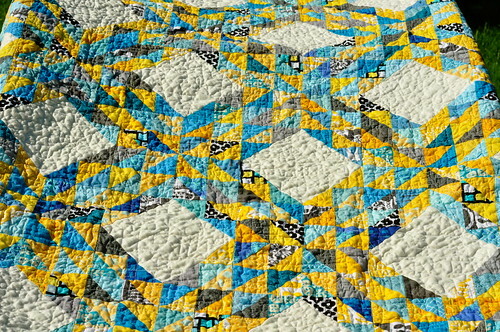 This block uses the Chinese Gongs pattern by Nancy Cabot. 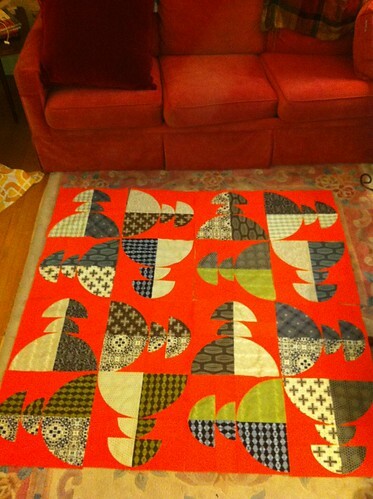 I used this block for my Gong Show quilt and I really like it. The blocks are fast and easy to put together and the only downside is using the plastic template and cutting by hand. So in this version, I am using the Curious Nature line, with Essex linen in Carrot as the background. The blocks are 14" finished. Back in April, when I only had four blocks made, I asked for feedback about potential layouts. Now that I have 16 blocks, I'm asking the question again. Which do you like best? (The photos aren't the best, but I think they give a general idea). This first one looks like sparkplugs, I think. These next two are more similar, but still different. I don't know - I'm leaning towards number one. What do you think? 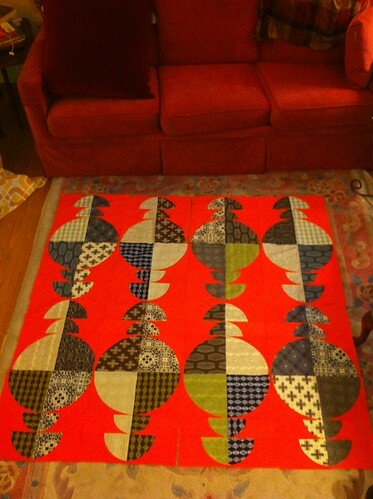 One more quilty story. Yesterday was the wedding of my doctoral student, who has been working with me in one capacity or another for more than seven years and of whom I am very fond. She was married at the Crystal Palace (which sounds very grand but is really a big barn with windows) at the fairgrounds in Prince Edward County. It was a lovely DIY wedding that was full of happiness and charm. The bride was radiant and I cried, of course - I can't help crying at a wedding! 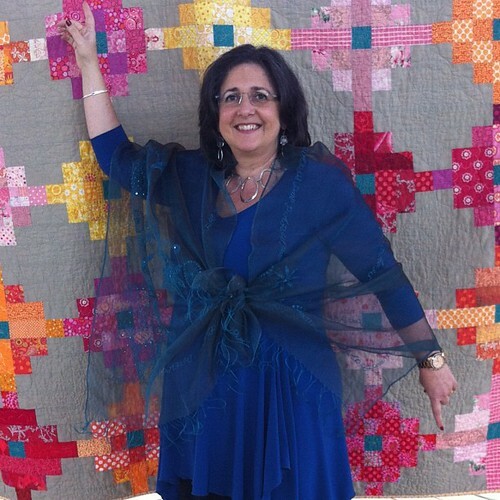 I was honoured to be asked, with my husband, to do a reading, and also to loan a quilt for the backdrop. My quilt Miss March had colours that were in the ballpark, so they strung it up on wires hanging from the ceiling. 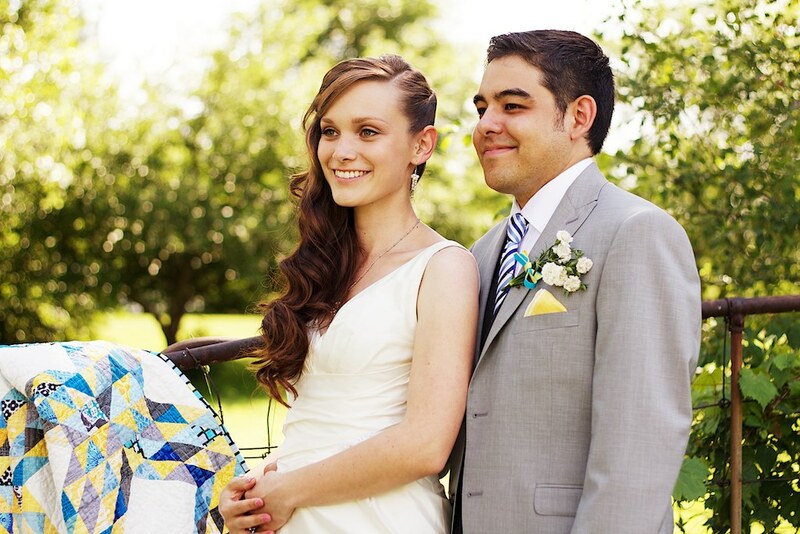 They stood in front of it when they exchanged vows. I wouldn't show photos of the happy couple in front of the quilt without their permission, but here's one my husband took of me before the ceremony. Huh. That's before the ceremony - I hadn't even had any wine yet.